Too many stocks climb into earnings release and then collapse. Some climb after release but who can predict the winners in advance? IRBT s a good example. 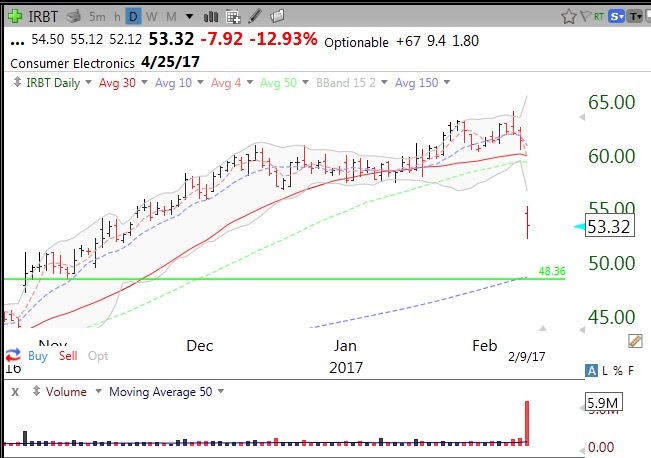 While I can see a few technical reasons in the chart that provided to me some warning signals to get exit my position (like the bounce off of the upper Bollinger Band), the best advance signal was the next earnings date (now 4/25/2017), which always appears at the top of my charts–thank you TC2000! One way to protect one’s position into earnings other than by selling out is to purchase short term put options (as insurance) on the stock. 42nd day of $QQQ short term up-trend; why are treasury bonds rising?